A self-photo, usually taken with a cell phone and posted online to social networks is called selfie. Almost, all over the world, different people - from kids to celebrities - are taking advantages of Smartphones camera technology and slick photo editing applications (particularly Instagram) to not only show others what they're up to, but also look perfect while doing it. But ever wondered, from where and how this selfie culture began. Let's take a look at below infographic by ebay. Basically the story of selfie starts with social media site MySpace, and, as Facebook overtakes MySpace, Facebook's design encourages higher quality profile pictures. In 2010 Apple releases iPhone 4 with front-facing camera, that gave users a complete control over framing his/her self photo. And in 2011 Instagram released hashtags and more filters, allowed users to edit contrast, brightness and color tones of photos. And in 2013 word Selfie officially added to Oxford dictionary. The usage of #selfie first appeared on Flicker in 2004 but it took almost a decade to reach the masses. The graph of Google searches indicates #Selfie notoriety began in late 2012. Selfie searches are popular in North America and Australia. 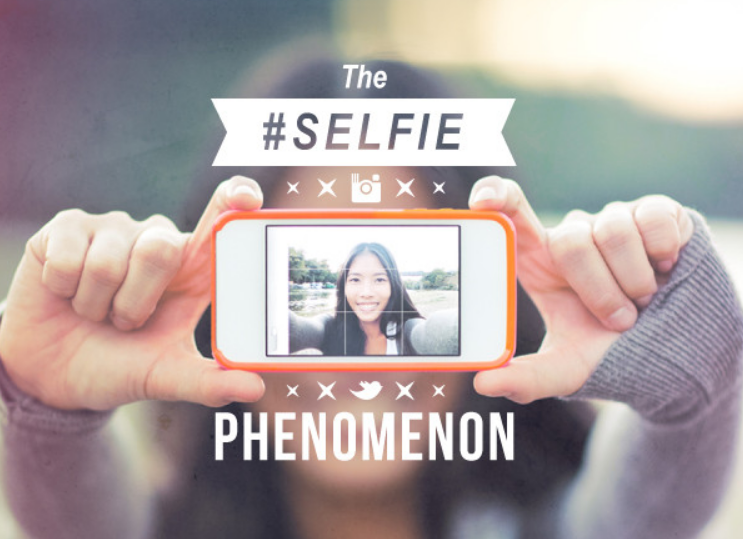 Look to Instagram to fulfill all your selfie needs. This app became immensely popular because it allows users to edit and share their photos, creating works of mobile phone art. A recent study shows that Instagram has more than 150 million users, 16 billion photos and 1 million + likes per day. That's why brands are also moving towards Instagram. The original #Selfie hashtag grew more than 200% in usage since January 2013, when it wasn't even one of the top 100 tags used on Instagram. Twitter is a popular social platform for world famous celebrities to interact with their fans. Out of all the Twitter celebrities. Miley Ray Cyrus posted the most with 121 selfies. Barak Obama Tweeted 0 selfies out of 1,463 messages containing photos or video, the lowest selfie rate out of top 100 celebrities on Twitter. Instagram is also very popular with celebrities for sharing selfies. The celebrity with the most selfies was Kylie Jenner of "Keeping Up with the Kardashians", sharing an amazing 451 photos of herself. Oprah Winfrey: Posted 0 selfies out of 265 pieces of media shared on Instagram, giving her the lowest selfie rate of any celebrity. Selfie enthusiasts can take advantage of new technology created to meet the growing demands of Smartphone and tablet photographers. We now live in a time when sharing your own photo online is not only common but also an accepted pillar of our digital identities. What remains to be seen is whether this trend is here to stay. Yet, if selfies are anything like our favorite pleasures, they'll be an indulgence people will always find a way to sneak back into their lives one way or another - ever after being told otherwise.